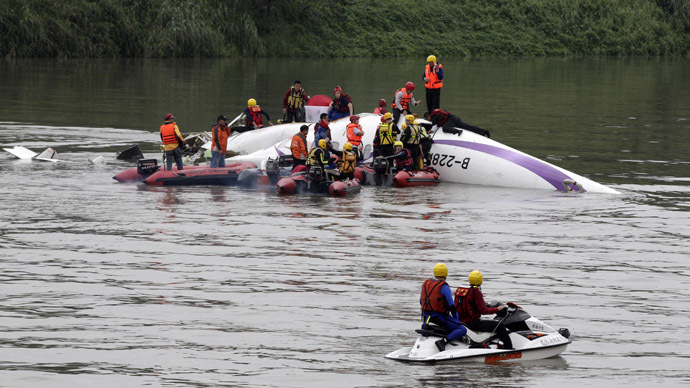 At least 23 people have been killed after a regional TransAsia passenger flight carrying 58 crash-landed into a river in northern Taiwan. Incredible video-footage of the crash has emerged, showing the jet nearly hitting a highway as it ditched. Dramatic dash-cam footage captured TransAsia Airways flight GE235 as it descended out-of-control towards a highway, moments before slamming into the Keelung River near the Taiwanese capital, Taipei. The plane was carrying 58 passengers and crew, including 31 tourists from mainland China, Reuters reported. According to the latest reports, at least 23 of those on board died, Xinhua says. Rescuers pulled 15 survivors from the wreckage during daylight and the rescue operation is still ongoing, AP reports. Taiwanese officials said the aircraft, a turboprop ATR 72-600, crashed shortly after takeoff from Taipei Songshan Airport. The aircraft was filmed as it passes close to some buildings before careening towards a highway. Moments before impact, the plane turns on its side, its left wing clipping the overpass guardrail as well as the roof of a moving vehicle. The plane’s underside is clearly visible as the falling aircraft narrowly misses a full crash into the roadway. Amazingly, the pilots were able to ditch the plane into the river flowing alongside the highway, which explains how some passengers survived the crash. Television footage showed several passengers wearing life jackets swimming clear of the wreckage. The death toll is expected to climb as rescue crews continue their effort to find survivors in the mostly submerged aircraft. Dozens of rescue teams in small rubber rafts are seen delivering what appear to be bodies covered in white sheets to the shore, just a few dozen meters (yards) away from the aircraft. At a live news conference on Wednesday, TransAsia CEO Chen Xinde offered his “deep apology” to the families of the passengers and crew aboard the downed flight. The last message from the cockpit was "Mayday Mayday engine flameout," according to an air traffic control transcript on liveatc.net. Twin-engine planes, however, are usually able to continue flying when one of the engines shuts down. TransAsia, Taiwan's third-largest carrier, received the ATR 72-600 that crashed on Wednesday in 2014 as part of an order of eight such models two years earlier. The head of Taiwan's civil aviation authority, Lin Tyh-ming, said the 72-seat aircraft last underwent an inspection on Jan. 26, Reuters reported. Last July, TransAsia suffered a similar disaster when one of its ATR 72-500 aircraft crashed while attempting to land at Penghu Island, killing 48 of the 58 passengers and crew on board. Wednesday's crash is the latest in a string of accidents to plague the Asian airline industry over the past year. On Dec. 28, an AirAsia jet crashed soon after taking off from the Indonesian city of Surabaya, killing all 162 passengers and crew on board. On March 8, Malaysia Airlines Flight 370 vanished from radar while flying from Kuala Lumpur to Beijing, China. The plane was carrying 239 passengers and crew members from 15 nations. Despite a multinational search effort, the plane has never been located. Four months later, Malaysian Flight MH17 went down in eastern Ukraine, killing all 283 passengers and 15 crew on board.